Center city Philadelphia is just 25 minutes or so away and Baltimore, Washington D. C. and New York City are all about two hours by car. But closer to the Valley is Lancaster and Amish country, the Reading outlets, the Delaware beaches and the Jersey shore including Atlantic City if you have an itch for the casino scene. All are day trip destinations, within easy reach from the Valley as are a wide variety of memorable experiences and worthwhile diversions. 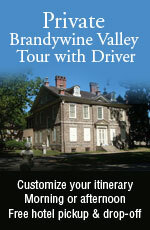 We will be adding to our Day Trip links every once in a while in keeping with our country casual update schedule.If you have a day trip experience you would like to share with TheBrandywine.com readers, we invite you to email us at hello@thebrandywine.com. We invite you to check back often. No matter your particular passion or pastime, there will be something for everyone. And if you have discovered something close-by that you would like to share, click here and let us know.